The instax SQ20 refines and improves on its predecessor, the SQ10. With newly-added video capture and zoom functionality, plus Insta-style creative effects, there's enough here to recommend it above others in the range. But for anyone who values their instant camera as a fashion accessory, the disappointingly bland design will likely prove off-putting. With Fujifilm using Photokina 2018 to announce a staggering 10 million instax sales in 2018, the debut of a new model at their press conference was hardly a surprise. The instax SQ20 is a new hybrid addition to the incredibly popular range that's now racked up 30 million units in total worldwide since its launch in 2014. And the square-format SQ20 was given significant space on Fujifilm's Photokina stand alongside its established family: the ever-growing mini range, the hugely popular SQ6 (now with added Taylor Swift edition), SQ10, WIDE 300, and of course the many related lifestyle accessories. Both of these cameras are exactly the sort of thing you will find in our best cameras for kids guide. The SQ20 is essentially an upgrade to the SQ10, which was Fujifilm's first instant camera to satisfy a clear requirement from core users: a digital display on the reverse of the camera to let users preview images before printing. But while it's an upgrade from the SQ10, in terms of compelling new features, the SQ20 feels a little underwhelming. The three main new additions are around video, creative effects and zoom. Video capture is limited to 15 seconds but allows users to cycle frame-by-frame through the footage in order to review and then select the perfect individual frame for printing. A wider range of Instagram-style filters and collage effects can be applied, viewed, and then printed, using the simple dial and buttons on the reverse. 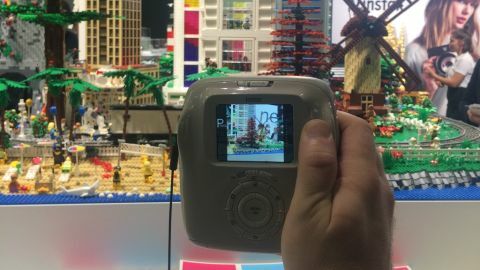 And the SQ20 is the first instax model to boast any kind of zoom option, with a 4x zoom that worked well against the Lego diorama Fujifilm had created for showgoers to shoot. Given it has a younger target audience in mind, the SQ20 launches in a strangely bland pair of colours: 'matte black' and 'beige'. Next to the ever-growing rainbow options of the SQ6 range, it seems a curious design misstep. In hands-on testing though, the SQ20 was as user-friendly and fun to use as any of the instax models. It's as simple to pick up and take a quick selfie (using the handy front-mounted selfie mirror to perfect your pout), as it is to cycle through the 18 filter effects, vignette and brightness controls. While the SQ20 is far less stylish than its brighter, more dynamically-modeled brethren, its practical plastic case is robust and the buttons and dial have a satisfyingly responsive feel. The rear dial and function buttons are chunky, and cycling between image previews (internal memory holds 50 stills), and selecting filter effects is fluid. The creative options are fairly limited, but what the SQ20 does, it does perfectly well. Video capture can be tracked using the dial, and a trio of movie filters can be used to add retro frame effects to captured video frames. The still image filter effects offer 12 retro styles and a couple of vignettes and brightness controls can also be applied. More impressive are the six partial colour filters (red, orange, yellow, green, blue and purple) which are surprisingly effective and likely to prove very popular with users. As seen in previous instax cameras, a bulb mode and double exposure feature can produce creative effects, but a genuinely new addition to the SQ20 is a timeshift collage feature within which four images can be captured at one time, with a time difference of between 0.2 and 2 seconds. The result is a collage of four shots that's particularly useful for capturing dynamic movement and action. At its heart, the SQ20 is a slightly more creative version of the SQ10; a fun, funky camera which, thanks to its digital screen, takes the gamble out of printing. And with the instax square format film coming in at around £1 per shot, that's peace of mind for anyone who's cursed a wasted shot from their SQ6 or mini. The in-camera effects, zoom and video capture function make it the natural entry point for anyone new to the instant camera scene. Yet existing instax owners - especially SQ10 users - are unlikely to see enough here to justify an instant upgrade. In terms of look and feel, the SQ20 sits squarely in the utilitarian rather than fashionable camp. Although future colour-ways are soon likely to improve the appeal for youngsters and hipsters alike. With an RRP of $199/£179, the SQ20 is ultimate another well-timed addition to instax's ongoing 30m unit success story - a story that's anything but beige.